A few years ago, the Toronto Blue Jays lineup was littered with position players who were top 10 among their peers. Josh Donaldson, Jose Bautista, Russell Martin, and Troy Tulowitzki to name a few. Now, aside from Vladimir Guerrero Jr. in the pipeline, the Blue Jays don’t have very many upper echelon players at their position. Except for one: Justin Smoak. The nine-year veteran, who enjoyed a breakout season at age 30, finally fulfilled his destiny to become one of MLB’s best first basemen. Smoak backed up his breakout 2017 campaign by swatting 25 home runs in 2018, setting a career-high for walks with 83 and posting a slash line of .242/.350/.457. He battled through injuries most of the season and played sparingly for the Blue Jays during the final month of the regular season. All that considered, he posted very solid numbers in 2018. His counting stats like RBI’s and home runs declined in 2018, as he traded some home run power for doubles last season. Still, his on-base percentage was on par with his breakout 2017 season. 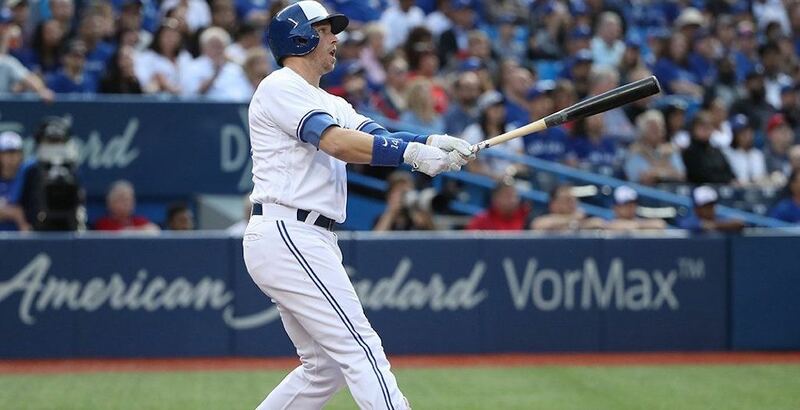 The 32-year-old is in the final season of his three-year, $16.5 million contract extension with the Blue Jays, which saw Smoak vault himself from a platoon player to the team’s everyday first baseman. The 11th overall pick in the 2008 MLB entry draft, Smoak was once touted as a top 20 prospect in baseball. His true arrival in the big leagues was seven years in the making, but for the past two seasons, he’s been one of the most consistent first basemen in baseball. 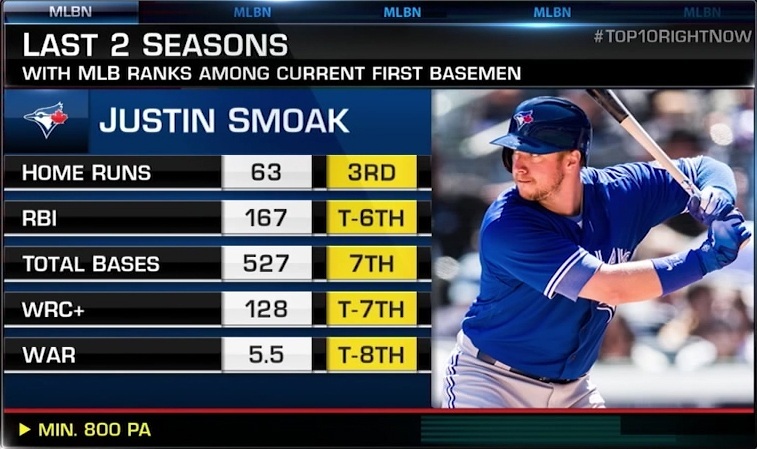 Stack his numbers from the last two years against his peers and the rankings check out; Smoak deserves to be in the top 10. He isn’t among the top-tier of players at his position like Paul Goldschmidt, Freddie Freeman or Joey Votto, but Smoak plays his position and hits at a surprisingly good clip. Let’s not talk about his base-running, because he’s one of the slowest first basemen in baseball, according to Baseball Savant’s sprint speed metric. First base isn’t the sexiest position in baseball. It seems like a rather mundane spot to play, but it’s a thankless position on the diamond. Defensively sound first basemen can dig out a lot of throws and turn errors into outs with the flick of a wrist. In fact, Smoak tied for the third most scoops among first basemen in 2018 with 28. Smoak has long been revered for his defensive ability at first base. Plus, it helps that he’s a 6-foot-4, 220-pound target for infielders to aim towards. He saves a lot of errant throws from a Blue Jays infield which had some of the worst defensive numbers in MLB last year. The fielding percentage statistic is a bit of an archaic and pedestrian stat, but for what it’s worth, Smoak posted a .999 fielding percentage in 134 games at first base in 2018. He made one error the entire year. 2019 is likely the end of the line for Smoak and the Blue Jays. Whether he rides out the full season or the Jays deal him at the trade deadline, he’s been a steadying force over there at first for the last two-plus seasons in Toronto. By now, most of Major League Baseball caught on to Smoak’s resurgence. First basemen are often a dime a dozen on the open market, but the Jays shouldn’t discount the impact that Smoak imparted on this team dating back to 2015.